Okay, kind of dying at this punny title, for real. I hopped on this collagen peptides wagon several months ago and I feel like I’ve hit jackpot. How is it that I’ve JUST discovered something so incredible? For those skeptical or curious, I also want to admit that I, too, was a skeptic. I thought it was just another health fad. Before making my first purchase, I did A LOT of research. I read every tl;dr caption on Instagram about them. I looked up the top brands that I could find and read a ton of reviews. I did this for months, then I flew with a flight attendant who swore by them. I guess I just needed to hear personal experience from someone in person because that day, I went home and placed an order on Amazon. Let me tell you firsthand that the benefits of collagen peptides are insane. Here are just some of them that really resonate with me. Contains protein, give your morning latte or smoothie an extra UMPH. Since the day I got ’em, I have been taking collagen peptides daily in my morning smoothies and have noticed these benefits. It’s unbelievable. One of the most incredible benefits that I noticed was when I was training for my half marathon. I was able to run longer with less discomfort in my joints. The day of the run, I hit my PR of 2 hours and 27 minutes. Not to mention, my recovery was quicker and smoother than my last half marathon. Crazy, right? Throw everything into a blender OR you can whisk manually or use a frother. I just got a frother on Amazon for $10. DEALS. Such a great idea for a stocking stuffer (yep, already going there). 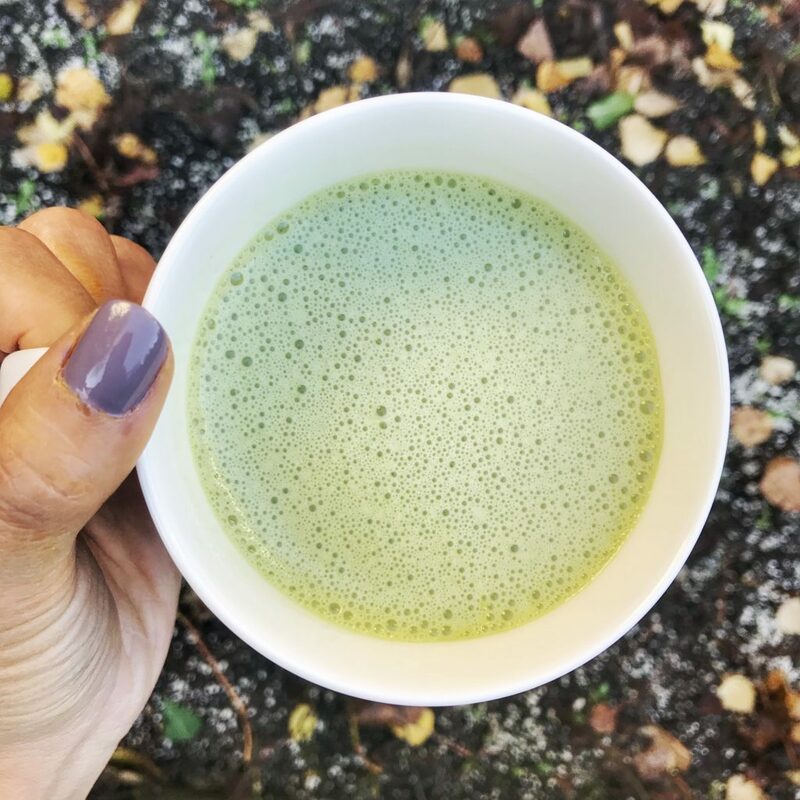 This latte is a perfect pre-workout elixir that’s made from natural ingredients and packed with a ton of nutrients and benefits from EVERY ingredient. Since weening off C4 (a pre-workout supplement filled with crazy chemicals), I noticed my workouts have become weaker. Since having this matcha mushroom latte, I noticed a boost in energy. It doesn’t feel crazy, I don’t get itchy, but it’s just enough to pull me through a HIIT workout + some weight training. This is real. I feel like I found the Krabby Patty secret formula! As far as brands go, Further Food is the brand I currently use and I absolutely love their products. Health things can add up to be pretty spendy but their products are affordable and have lasted me so long. They’re a great company made up of friendly people who are passionate about health and wellness, which is something that’s super important to me when I do brand research. I’m a proud brand ambassador of theirs and if you use my code ‘KALEINTHECLOUDS10′, you’ll get a discount on anything on their website! I would never talk up something I don’t feel passionate about so you know this is real. Do you guys use collagen peptides? What do you like to use them for and what are some of your experiences as far as benefits you’ve noticed? Let me know! If you’re curious and still have more questions, feel free to leave me a comment or e-mail me at kaleintheclouds@gmail.com. I tend to get rambly about things I love so if you’ve made it this far, I love you and hope you have a great day!